As a Jesus follower I have been part of a number of Christian “cultures.” I have wondered at how certain theological doctrines came to take such an important role in each of them. The tenets of the Christian faith are the same, but there exists in all Christian “cultures” certain doctrines that seem to be “lines in the sand” for separation and clarification, creating a Christian placement of sorts. There is one common denominator.--sin and repentance. At one conference, I sat in a Presbyterian sanctuary listening to Southern Baptist, Anne Graham Lotz preach that if sin is allowed to continue in an individual’s life, or in the life of a Christian community, and repentance is ignored, ultimately the presence of the Holy Spirit will cease to be exist. Why? Because sin separates us. It shouldn’t be that difficult to understand. Have you ever witnessed two people refusing to talk to each other? If left unresolved it will carry them farther and farther away from each other. The hard part is confessing the sin that distances us from each other as well as from the embrace of the Trinity. 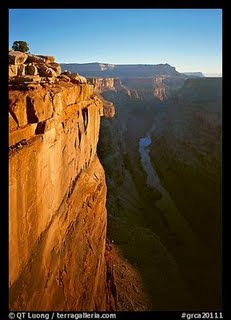 Believing in confession of sin and practicing it, reside on opposite plateaus of the Grand Canyon. Confession and repentance requires going down into the depths in order to come up on the other side. But, the alternative is living a life separated from God. Getting down where sin resides won’t be pretty. But, when we climb up and reach the other side, the hot shower of God’s love will have washed all the dirt away. thoughts and attitudes that separate me from You. I ask for Your forgiveness. Give me the comfort of your embrace.